The clock case houses a Crystal Quartz Pendulum movement that is powered by battery – LR6 alkaline (AA). If you have a question about the AMS 1117 Table Clock or are looking for advice before buying, then please get in touch by email or phone – see details on the Contacts page. You can read about guarantee, price matching and warranty on the Customer Service page; and find some clock information on the site’s Blog. and the FAQ page. Free delivery to any UK address. AMS clocks are normally delivered within seven working days, however on rare occasions unforeseen delays can occur that are out of our control. Should this happen, you will be informed as soon as we are made aware of any delay. If time is crucial, please contact Clocks & Chimes for more details regarding your choice of clock. Clocks & Chimes will let you know the expected delivery date, and of any likely delay beyond the normal delivery time. 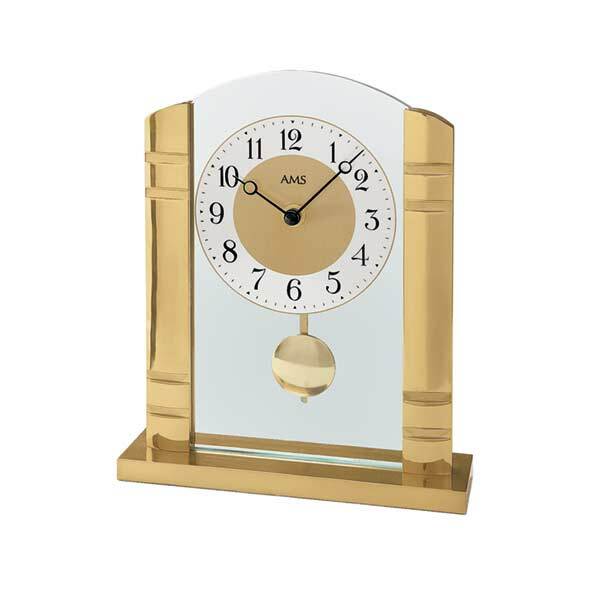 AMS 1117 Table Clock is produced by AMS in Germany. AMS has 150 years in designing and manufacturing to the highest quality standards, in the very best Black Forest clock-making tradition. Renowned for their accurate movements, and the use of only premium-quality materials, the timeless design and aesthetics of AMS’s table and wall clocks, stand apart form other manufacturers. Free delivery to any UK address. AMS clocks are normally delivered within seven working days, however on rare occasions unforeseen delays can occur, which are out of our control. Should this happens, you will be informed as soon as we are made aware of any delay. The AMS 1117 Table Clock is produced by AMS in Germany. AMS has 150 years in designing and manufacturing to the highest quality standards, in the very best Black Forest clock-making tradition. Renowned for their accurate movements, and the use of only premium-quality materials, the timeless design and aesthetics of AMS’s table and wall clocks, stand apart form other manufacturers. If you have a question about the AMS 1117 Table Clock or are looking for advice before buying, then please get in touch by email or phone – see details on contacts page.